We are proud to present ‘Haudattujen Valvoja’, the new album of Halo Manash through our Sublunar series. The material on the album weaves together the encounters and sacred meetings of the group from the past four years. The sonic-portals or liquid-entrances in ‘Haudattujen Valvoja’ are all authentic live recordings captured on tape with only two microphones in the group’s private Temple Hwaar. These slowly submerging, distant hymns were performed mostly through self-made instrumentation and found Otherworldly Roots and unlike before, all instruments were manipulated live through amps, cabinets and amplified speakers. Compared to the earlier Halo Manash albums, the resurrected resonances in ‘Haudattujen Valvoja’ lean to a more unpolished yet flowing elemental sound. The release of the album closes a greater inner cycle of the group that was initiated over a decade ago; Par-Antra I: VIR. The album consists of seven, otherworldly movements; first three were presented live in Finland, Germany and Russia during 2013 and the remaining four in Austria, Finland, Sweden and USA during 2013 – 2014. The elemental, rhythmical language of ‘Haudattujen Valvoja’ fosters a shimmering yet haunting haze, that guides the perceptive listener far from the domain of conscious and logical mind towards the subliminal realms where the posture of Aqua-Aurorae awaits. Total running time: 71:11. 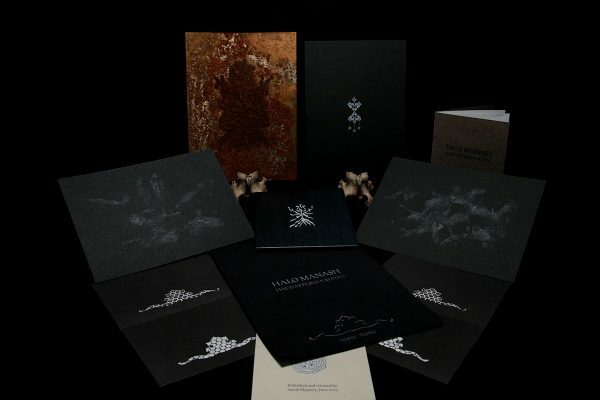 ‘Haudattujen Valvoja’ box set is limited to 87 copies and includes the regular CD edition, 3 silk-screen printed astral-molecule-portraits and a corroded metal plate carrying the hand-crafted symbol of ‘Haudattujen Valvoja’ – all housed inside a handmade dark blue cloth bag.